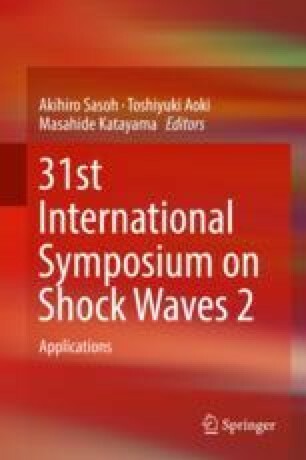 This paper describes culture regeneration system combining cultivation promotion and capsule destruction using shock wave, especially the basic mechanism for its development such as deformation process of a bubble in a microcapsule composed of membrane, liquid, and gas bubble. Necessary tasks to optimize the improvement of cell culture rate and the microcapsule disintegration rate by pressure control are (1) investigation of the influence of amount of gas bubbles and pressure waveform on the threshold of capsule destruction due to bubble collapse and (2) estimation of threshold of pressure for the collapse. It is concluded that (1) maximum amplitude of bubble, which corresponds to the degree of damage, is decreasing as the gas ratio is increasing, and (2) maximum amplitude of bubble is also decreasing as the duration time becomes smaller order.